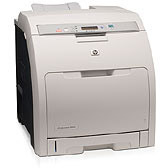 An HP Color LaserJet 3000n printer is the heart of any office that uses this device. With print speeds of up to 30 monochrome pages per minute (ppm) and 15 color ppm, a resolution of 600 dots per inch (dpi), and ethernet connectivity, this workgroup printer won’t let you down. However, a printer is only as good as its toner. Paying for original equipment manufacturer (OEM) products can quickly drain your budget. When it comes time to buy toner for an HP LaserJet 3000n printer, you could spend hundreds of dollars on OEM products, or you could save over 50% off the OEM cost at 1ink.com! These remanufactured HP 314A toner cartridges offer all the convenience and performance of an OEM product. You’ll get the same page yield (6,500 pages in black, 3,500 pages in color), shelf life, and stunning photo print capabilities that you’d get from using OEM HP toner so your office can continue with day-to-day operations. Don’t let costs keep you from getting professional-quality work; switch to 1ink.com and enjoy the work quality you need for less.